This is a story of our history and machine capability please scroll down for the latest roll fed full colour label printers able to print labels for outdoors and chemical product, drum and IBC labelling to BS5609 / GHS international shipping regulations. It’s possible to Print Your Own labels for chemicals. Chemicals covers a wide range of industries. Labels can be full colour and highly decorative for retail packs of cleaning solution products sold in superstores, or simpler designs for trade containers. Labels can be quite large sizes for drums and Intermediate Bulk Containers (IBC’s) and often extra durable when used for outdoor storage, transport and shipping to BS5609 marine submersible standards. The main thing to consider is the need to at least comply with Global Harmonised System (GHS) whereby you may need to change your label printer to be able to print the new red diamonds and black pictograms in the new and correct formats. Don't get too wound up about BS5609 since we have labels printers that comply with the new GHS standards and many will still be able to use paper (indoors) or polypropylene labels (indoors and outdoors and when paper labels can wrinkle on packs with heat and humidity variations). 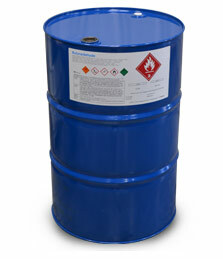 The BS5609 is the ultimate durability specification if shipping drums and IBC bulk containers by ship when the labels should be to BS5609 in the event of the container being washed / lost overboard and the contents needing to be identified, especially if hazardous, when the container reaches the shore. OFFICE DOCUMENT SHEET PRINTER FOR CHEMICAL LABELS? Though we don’t specialise in office printers we see users printing labels on their office sheet printer but complain of bad reliability and high service intervals. The sheet fed machines have a ‘finger’ mechanism to pick up each A4 page and the extra thickness of self adhesive sheets often a causes label sheets to jam in the feeder. The problems are worsened since laser toner printers use a heater roller at 160 to 180 degrees C inside the printer to ‘fuse’ the colour powder toner to the surface of the label media. No matter how carefully they are made labels on A4 sheets have exposed adhesive at each of the four sides often softened or melted before the sheet can exit from the printer. 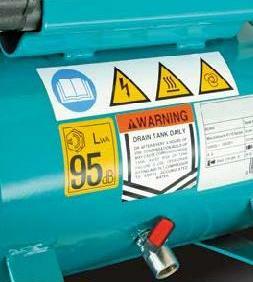 Plastic type labels can also shrink or wrinkle cause further risk of jamming up inside the machine. 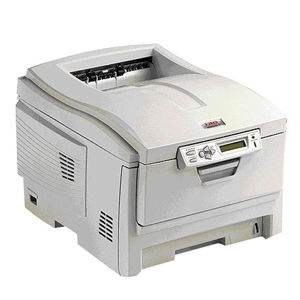 Many of us will have had to extract a miss-fed printed document sheet from inside an office printer but the problems are much worse if the sheet is melted onto the fuser for example, permanent damage to the printer is likely. The problems are worsened when printing labels for chemicals since we use thicker and more aggressive adhesive to ensure the labels stay on our containers and drums. Many manufacturers of laser sheet printers publish warnings against using self adhesive labels and that any damage caused will void the warranty. For many years we have supplied many thermal transfer printers for chemical labelling. Labels supplied on rolls with part printed then familiar orange boxes in fixed positions for overprinting with warning symbols. The customers logo would be pre-printed say at the top and leaving enough space on the label for the user to add the black Risk and Safety symbols and product information using a mono thermal transfer printer having a single black ribbon, a low cost and reliable method since the early 1980’s. In 2000 we were selling 4 colour thermal transfer printers having space to fit 4 ribbons one of each colour required for the label design. Plain white labels reduced the costs and now the colour printer could print the orange orange squares and that left three other 'spot' colours one of which had to be black to add the warning symbols and that left two colours for a logo. The spot colour label printers could do a four colour label of sorts and an attempt at pictures and logos but the pictures were a bit grainy, we kept them at spot colour printing and sold quite a number printing onto low cost polypropylene (PP) labels after changing from polyethylene (PE) that proved a bit stretchy in the summer heat. The new "Globally Harmonized System of Classification and Labelling of Chemicals (GHS)" and Classification Labelling and Packaging (CLP ) in Europe govern new standards for chemical labelling and shipping. 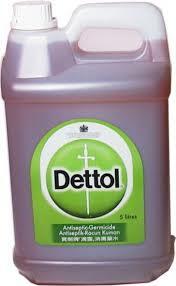 However the changes bring some difficulties for us to overcome when printing our own labels. The old black symbols against an orange background have changed to almost similar pictograms inside a red warning diamond. Well that would not have been so bad but the new rules say we need a warning diamond to inform of each hazard but we can’t have any empty diamonds on the label so its not a simple matter to have preprinted red diamonds and infill with black symbols as previous. This means we need at least a two colour red / black printer that adds as many red warning diamonds with their pictograms within as needed. 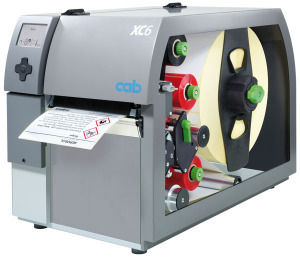 We have therefore supplied some two spot colour printers like the CAB XC4 and XC6, having a red and a black ribbon fitted and supplied labels with the customer logo pre-printed as before. There is an opportunity with new legislation requirements to jump to full colour label printing for products and we have a choice of using inkjet or laser roll fed machines that have become available. These have advantages over previous methods of printing very high quality often as high as 2400 dpi or 4800 dpi photo quality, but care care should be taken to select the correct method to suit your needs. Desktop colour label printers that we can use for printing labels for chemicals are either inkjet or laser and roll fed. The printers are likely to be based again on office document printers but adapted by specialist manufacturers for purpose of labelling and have at least a roll UNwinder added to feed a roll of blank labels into the printer and often a REwinder at the outfeed so as to wind the printed labels back onto a finished roll. The roll printers will also be fitted with a sensor that can detect the gap between each pre-cut label so to know where to print the image for each label and such that the images stay in register and well aligned with the blank labels even when printing at high speeds. The advantage of labels on rolls is that rolls are lower cost to make in bulk our specialist factories with automated cutting and winding facilities and once labels are wound onto a roll there is less exposed adhesive to jam up a label printer. With the PRIMERA LX900e, pigment ink set and our SJET PP label media its possible to print durable labels in full colour that satisfy BS5609 parts 1, 2 and 3 that is to the international shipping and Marine Submersible Specification but certainly also durable for extended outdoor use. The amazing 4800dpi print quality of the LX900e means you can print ultra sharp pictures, barcodes and text down to a very small size and sill achieve clarity. The oscillating print head method employed is self-correcting against any missing nozzles and ensures no streaks or lines in the print maximising print quality. With the PRIMERA LX2000e, pigment ink printer is was designed for outdoor durable labels from the start with highly durable pigment ink as standard. With our matt white SJET PP label media its possible to print durable labels in full colour that satisfy BS5609 parts 1, 2 and 3 that is to the international shipping and Marine Submersible Specification but certainly also durable for extended outdoor use. The amazing 4800dpi print quality of the LX2000e means you can print ultra sharp pictures, barcodes and text down to a very small size and sill achieve clarity. The oscillating print head method employed is self-correcting against any missing nozzles and ensures no streaks or lines in the print maximising print quality. 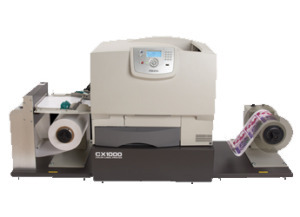 The LX2000e has slightly larger ink tanks that its LX900e brother so expect about 30% reduction on label print cost. To create label images Inkjet label printers spray coloured ink from ink cartridges or larger bulk tanks onto quick drying label media. The printers that use pigment ink like our Swiftcolour SCL-8000P rather than dye ink are prefered for chemical labelling if the labels are to be used outdoors or for international shipping. Pigment ink is less likely to lose its colour or fade with sunlight over time and when printed onto a quick drying plastic face label such as and inkjet PolyPropylene (PP) the label can be fully waterproof to suit outdoor storage in all weathers. 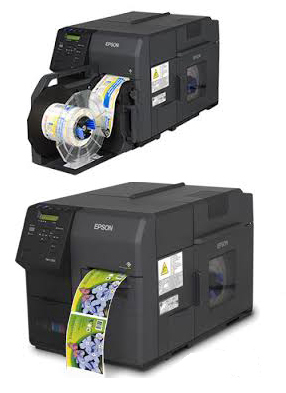 The EPSON C7500 ColorWorks printer is equipped with pigment ink and using our SJET MATT WHITE PP label media full colour labels can be printed at low cost and high speed to BS5609 high durability for chemicals and outdoor labels like for growers plants and vegetables. We previously discussed how laser toner printers use a high temperature heater roller that can melt the adhesive and jam up the printer. Some manufacturers have thought this through and supply roll fed laser toner machines like the PRIMERA CX1000e to help overcome the problem.. Again using a roll UNwinder to provide a continuous feed to a roll fed machine it is far less susceptible to jamming than when using sheets especially when the printer has a ‘straight through’ material path this further reduces risk of any snagging and allows for higher speed throughput. Most readers will be familiar with a normal roll of labels with cut border and gap waste removed from the edges and between each label. Its possible for us to make the labels on rolls in different ways to assist us with desktop label printing. It’s safest when using a laser roll printer for us to leave the face waste on. When when we make the labels we kiss-cut the shape of the labels into the face material and do not strip of the waste to create the gaps. We instead add a black registration mark at each label start position on the backing paper that the printer sensor uses to register the printed images by black mark instead of the gap. ste and applies it to the product or container. There are quite good advantages to leaving some waste material around our labels when printing in colour especially if the labels is round, oval or an unusual shape. Firstly there is a border onto which we can over print called ‘printers bleed’ just like at our full scale label factories we do this to ensure that after label removal there is a little overlap of colour left behind and there is no change of having any white lines left on the edges of the label. Secondly when printing in a desktop printer there is inevitably some small amount of side to side roll ‘rattle’ as the roll is printed at high speed and again the a few mm of bleed border is good to ensure enough tolerance so again we avoid any white unprinted margin spoiling our print. If the user really needs waste stripped labels with gaps, say to feed an automated label apply machine, then we need to use a separately supplied roller system like the FX1000e to strip of the waste and maybe slit the label to finished width rolls before transferring the rolls to the automated applicator machine. Another technique allows users to achieve a very low cost per label with a little higher investment in machinery and popular for customer with many sizes of labels and historically too much kept stock. Only low cost uncut rolls of self-adhesive label material need be ordered and stored ready for use. A blank roll of label media is loaded to the digital roll printer or inkjet or laser type and the label images printed at speed this time also self printing black marks onto the top surface along side each label image. The roll is REwound as normal then passed onto a digital ‘finishing’ machine. A digital finishing machine is another desktop device that will re-register on those black marks then automatically cut out each label no matter what shape or size. You can imagine the flexibility of using low cost roll and making any size label you need in the exact quantity you need for each product and without wastage, avoiding all the cost of commercially printed labels, print plates, cutting charges and wastage. Digital finishing machines are available that use one or more cutting blades that are computer guided to follow the cut line found drawn into most label artworks. Some cutting machines are starting to use a laser cutting beam to increase throughput speeds. 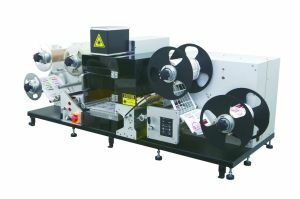 Usually a good finishing machine will have the ability to apply a thin clear laminate to the printed work before cutting and then slit the work into one or more lanes and rewind to separate finished cut roll so that for smaller size labels several rolls can be made from one material width in one pass. The laminating ability of a digital finishing machine will be of special interest to chemical manufacturers who would like an extremely durable label even protected against the more aggressive chemicals that would normally dissolve the ink of unprotected labels. Laminating is a sure way to make protected labels that have a high resistance to sunlight, water, rain, chemicals and abrasion. The British Standard BS 5609 indicates if a self adhesive label can be durable enough to withstand marine submersion to and extended time span as well as resistance to Ultraviolet (UV) components of sunlight that can cause printed labels to fade to a point where warning information could be obliterated. A BS 5609 part 1 and 2 rating on our label materials means it has been tested by the Print Industry Research Association (PIRA) UK for 6 months submersion in the Ocean waves, sunshine, wind and weather and the label structure and adhesive has survived, just as if it had been on a drum container on a ship and washed overboard in a storm and the label had to remain affixed to a drum washed up on a beach some place half a year later. Additionally when approved for BS5609 part 3 the colour print has also been tested using continuous high energy UV light and sand abrasion rub testing to simulate outdoor wear and tear. BS 5609 is a strong test as to the endurance capability of a label and is a good indicator as to suitable for chemical labelling applications. Read More visit our colour label system store or use the CONTACT page to ask any questions.